Posted on Thursday, August 9th, 2018 at 9:26 pm. 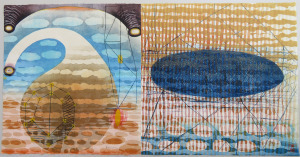 Project Volumina presents a print installation of compelling new work by artist Karen Kunc, created while on Faculty Development Leave in spring 2018. She was inspired by viewing collections and treasures from museums and libraries to create a new “image bank” of resources. Specifically, she studied rare books, manuscripts and incunabula (early printed books before 1501 in Europe) from the Dibner Library of the Smithsonian Institution, and the Library of Congress while in Washington DC. References are drawn between historical processes and technologies, scientific illustration, printed conventions of spatial illusions, systems of charting, mapping, mathematics, alchemy and astronomy. She discovered these ideas from topic selection, chance encounters, page turning, following threads of connections and visual stimulus. 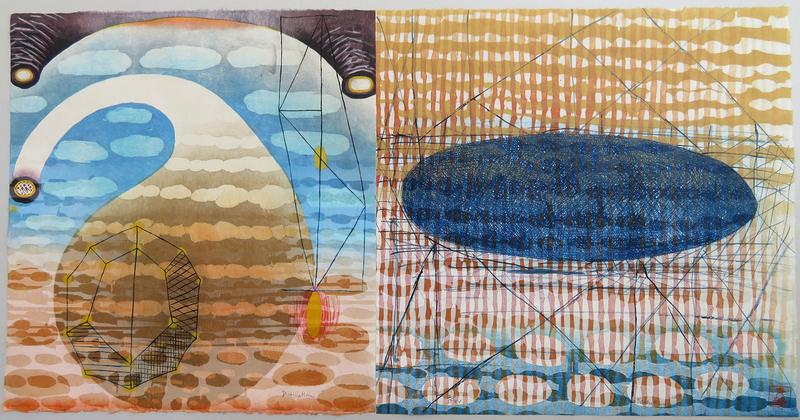 Her new prints are created in a mixed media approach from woodblocks, etching plates, hand coloring, pochoir stencils, while trusting the unpredictable for experiential responses. Volumina revisits a theme Kunc has addressed in the past, and here again, her printed pages suggest quantities and quantities…..of printed knowledge or lore, history forgotten yet preserved, and inevitable change through time.